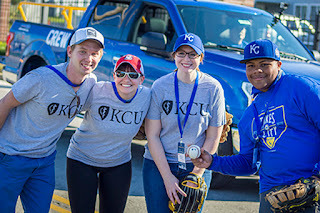 On April 3rd, KCU students and staff participated in "Relay the Way," the longest Major League Baseball opening-day first pitch across Kansas City to raise money for the Kansas City Urban Youth Academy. Located at 18th and Vine Streets and operated by the Kansas City Royals, the Academy will teach baseball, softball and life skills to hundreds of kids ages 6 to 18 years. 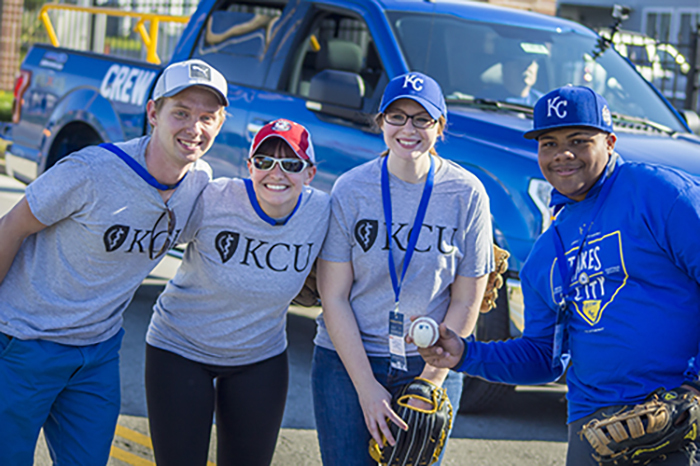 Approximately 2,500 Royals supporters joined the relay, throwing and catching a ball over a 10-mile stretch from Union Station to the pitcher's mound in Kauffman Stadium. KCU served as a sponsor for the event, further demonstrating our commitment to improve the well-being of our community. See photos from the event.